This is the second post in the Two Ways with Bolognese series. 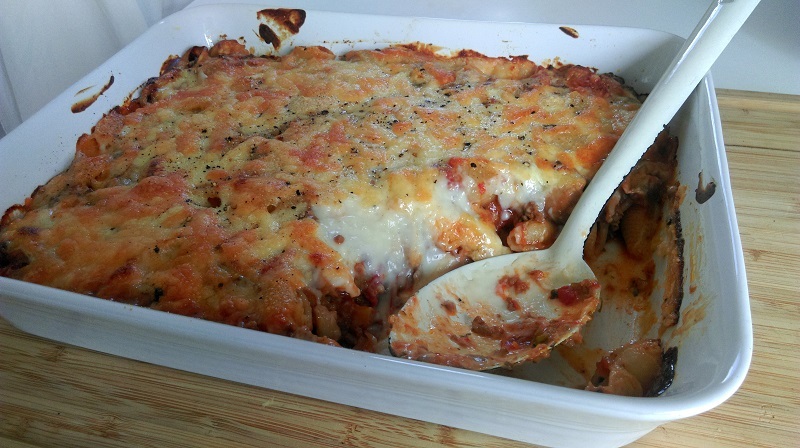 The first post was the much loved British classic Spaghetti Bolognese and the second is what I like to call, Lazy Lasagne. 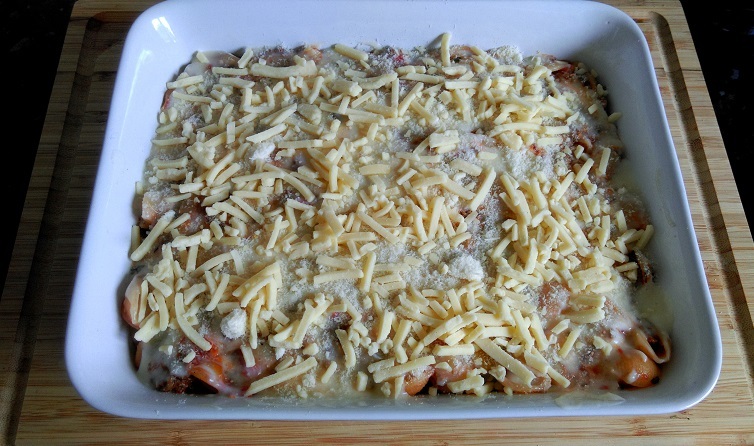 Lazy Lasagne is the antithesis of a classic lasagne in that it cuts out the faff of pasta sheets and the whole layers malarkey. Instead, you chuck everything you find in a lasagne (pasta, white sauce, bolognese and cheese) into a dish and bake. My version may not have the neatness and structure of a classic lasagne but what it lacks in tradition it makes up for in taste. 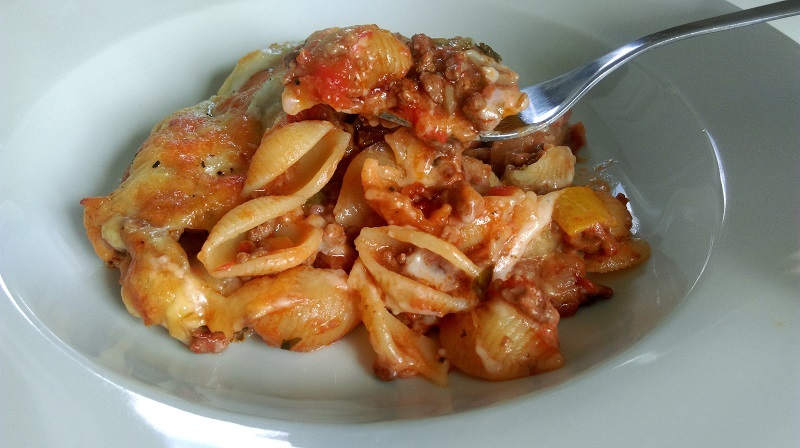 This recipe can be used with leftover bolognese which means you could get dinner on the table in about half an hour. 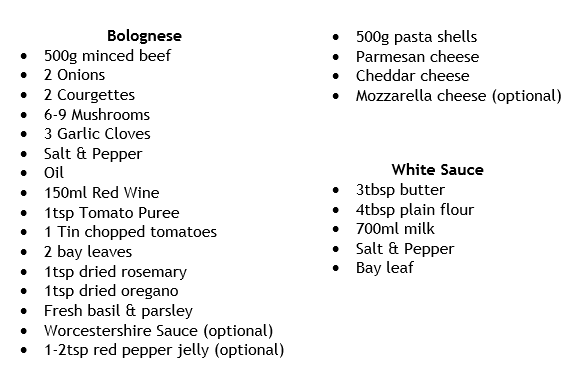 If you prefer to make the bolognese from scratch, as outlined below, then bear in mind it takes approx 2 hours to cook. 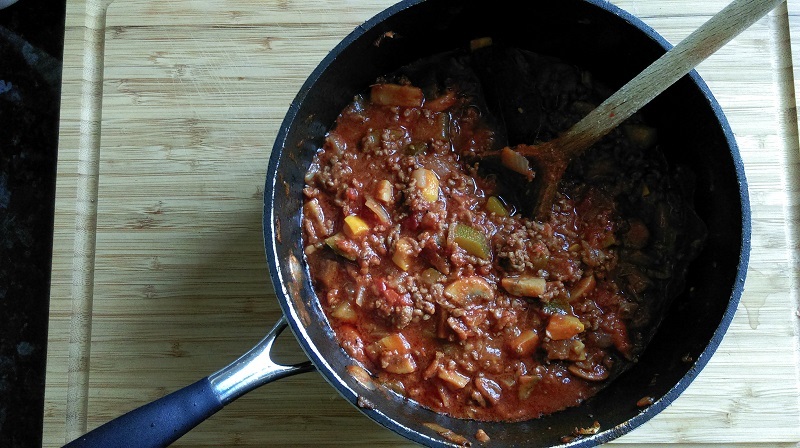 It’s also worth noting that this recipe makes 2 batches of bolognese so you can use the leftover bolognese for another day or feed more people. This will serve 4 hearty portions. Make it Veggie: Replace the minced beef with puy lentils. Cook onions, mushrooms & courgettes in oil over a medium heat for 5-7mins. Stir in the lentils & garlic then continue the instructions below from where the tinned tomatoes are added. Cook for 1 hour until lentils are soft. Make it Vegan: You could try a white sauce with rice milk & vegan margarine. Replace the cheese with vegan cheese or remove altogether then ensure the pasta is vegan friendly (i.e. the ingredients are only Durum, Semolina and Water). 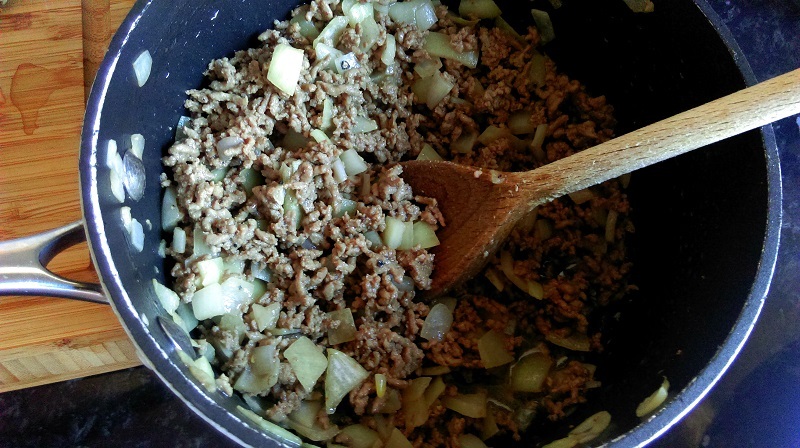 Break up the minced beef with your fingers & add to a large pot. Dice the onions into large chunks & add to the pot of mince. Season with salt & pepper and cook over a high heat. Stir a few times to ensure the mince browns all over. Once the mince is browned add the chopped mushrooms and courgettes to the pot along with dried herbs and bay leaves. Either grate, chop or crush the garlic cloves & add to the pot. Cook on a medium heat for a few minutes, stirring regularly. Add the tinned tomatoes to the pot. Half-fill the empty tin of tomatoes with water, swirl it around and add to the pot. Pour in the red wine, tomato purée and red pepper jelly & Worcestershire sauce. Bring the bolognese to a boiling point then partially cover & reduce to a rapid simmer. Cook for 1-2hours. If you feel the bolognese is too watery, remove the lid & increase the heat. Let it bubble away furiously, stirring occasionally to stop it burning, until the liquid reduces. When the bolognese is ready decant half of it into a Tupperware tub or freezer bag. Keep it in the fridge for 2-3 days or freeze for 2-3 months. 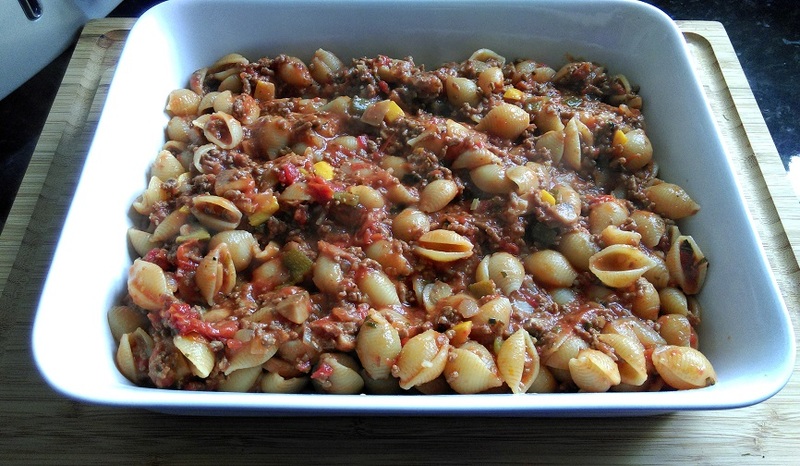 Leave the remaining bolognese in the pot while you make the white sauce & pasta. Pre-heat the oven to 200C and boil the kettle for the pasta. Melt the butter in another pot over a medium heat. When it starts to sizzle add the flour and stir until it comes together to form a lump. Continue to stir & cook for 1 minute. Add the milk, a little at a time, whisking between each addition. At first it will feel like the sauce is not coming together or its too thick, but persevere. Do not be tempted to add all the milk at once because this is how you get a lumpy white sauce.Continue whisking the white sauce until all of the milk is added. By now it should be smooth but perhaps not very thick. When the sauce starts to bubble reduce to a low heat, season with salt and pepper and cover with a lid while you make the pasta. While you make the pasta, occasionally whisk the white sauce to stop it burning or becoming lumpy. P.s. If you add cheese to this white sauce, you can make Mac & Cheese. 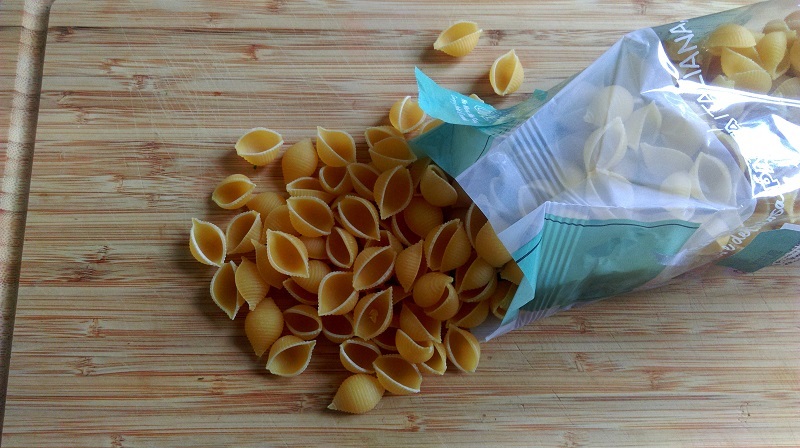 Cook the pasta until al dente or according to packet instructions. Drain the pasta and stir it into the pot of bolognese. Mix together then pour the bolognese pasta into a large roasting dish. Give the white sauce a final beating with a whisk to make sure it’s smooth then pour over the top of the bolognese pasta. Top with cheese (paremesan, cheddar, mozzarella or a mixture of the 3) and bake in the oven for 20-30mins until the cheese is melted and golden. Leave to stand for 5mins before serving.